Healthy cooking is expensive?! Nothing could be further from the truth and I’ll show you in this blog post! Cooking at home is not only more economical but it tastes better and is better for you. I’ll even take it a step further to say, the more you plan out your meals, the more you’ll save, the less you’ll waste, and the less kitchen stress you’ll have! Follow this easy plan to make five delicious meals that serve two people for around $30 in groceries. Combine these ingredients with basics you already have in your pantry like olive oil, salt, pepper, spices and possibly nuts and dried fruits like raisins or cranberries if you have them on hand. Who doesn’t want to save time and stress in the kitchen? Well here’s one of the ways you can do it! For starters, make a homey chicken vegetable soup that you will enjoy for two meals, a satisfying dinner and a quick lunch or dinner throughout the week. 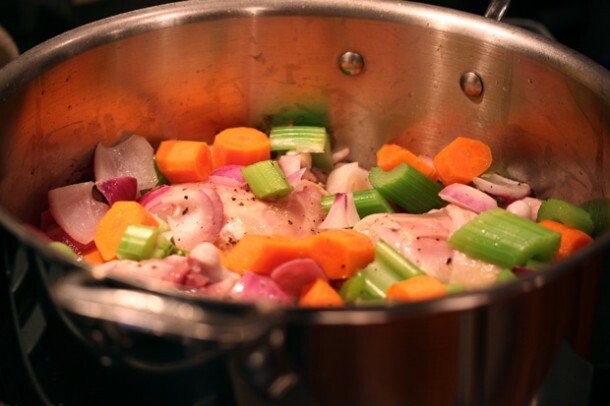 Cooking a large pot of hearty chicken vegetable soup allows you to use the cooked meat for the other meals. To start the soup, prep the veggies. Peel half the carrots and chop them, transfer to a bowl. Chop half the celery and both onions, add to the bowl along with the carrots. Sprinkle the chicken thighs with 1 teaspoon salt. Heat a large stockpot over medium heat and add 1 tablespoon of olive oil. Add half the chicken, skin side down and cook 3 to 4 minutes, turning once or twice until the chicken is well browned. Transfer to a plate. Add another tablespoon of olive oil and the remaining chicken thighs. Cook 3 to 4 minutes, until the chicken skin browns. Transfer to the plate with the other chicken thighs. Add the vegetables and brown, cooking 3 to 4 minutes more. Return the chicken thighs to the stockpot along with their juices. Cover with the chicken broth and bring to a boil over high heat. When the broth comes to a boil, cover and reduce to a simmer. Cook 20 minutes until the chicken is cooked through to the bone. Transfer the chicken to a plate to cool 10 to 15 minutes. Remove the skin and discard. Shred the chicken and return one cup of it to the broth with the veggies. Reserve the remaining chicken for the other three recipes. Discard the bones. Serve the soup immediately. Allow the reserved chicken to cool completely before storing it in an air-tight container for the remaining recipes. Cool leftover soup completely before storing refrigerated, in an air-tight container for another meal. Chop one cup of the reserved chicken meat and add to a large bowl. Chop the remaining celery and add it to the bowl along with 1/2 cup mayonnaise, 1 teaspoon Dijon mustard, 1/2 teaspoon garlic or onion powder. Mix well and serve or refrigerate, in an air-tight container, until ready to use. 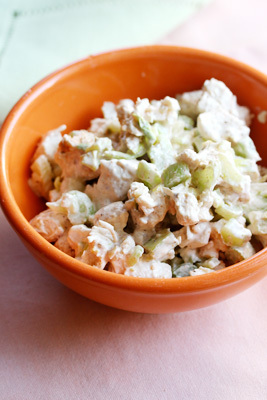 Use this tasty chicken salad with any leftovers you might have in your fridge like cucumber wedges, whole grain bread, or serve over whatever salad greens you have on hand. If you happen to have plain yogurt on hand you can switch up the recipe to 1/4 cup plain yogurt mixed with 1/4 cup mayonnaise. Chicken thigh meat (minus the skin), makes the richest, moistest chicken salad and it’s far more economical compared to drier chicken breast especially if you go for organic chicken. If you can’t or don’t want to do mayo, drizzle with a tablespoon of olive oil and add a teaspoon of mustard. Add a handful of fresh herbs if you have them or a tablespoon of the jarred salsa for extra flavor. Coat a baking tray or toaster oven tray with cooking spray. Chop one cup of the reserved chicken meat and divide it between 6 taco shells. Sprinkle a tablespoon of the grated cheese inside each shell and transfer to the prepare baking sheet. Bake 8 to 10 minutes until the cheese is melted and the shells are crisp. 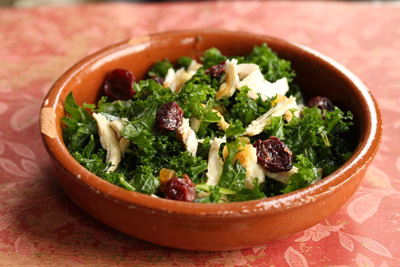 Add 1 cup of thinly sliced kale or other salad greens that you have on hand. Top each with 1 tablespoon of the salsa and serve immediately. 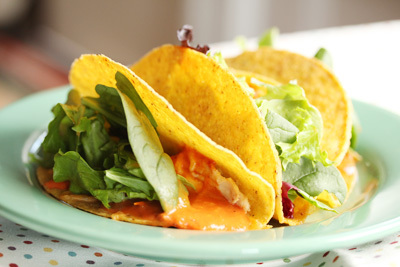 To pack these tacos to go, pack the salsa separately and allow them to cool before storing in an air-tight container. I get a lot of complaints that kale is tough, but in this recipe I share the secret to making kale tender and delicious. Tenderizing kale is two-fold process, massaging it first with the oil of your choice and letting it rest in the fridge over night. So prep ahead and make this recipe the night before you plan to eat it. I recommend curly kale for “kale beginners” since it has a mild taste and is easy to find in any grocery store. Kale is not only super inexpensive and filling but it’s the most nutritious plant around – making it a top superfood any way you slice it. To make it into a tasty salad follow the instructions below. Rough chop the kale and place it in a large bowl along with 1 tablespoon of olive oil, 1 tablespoon vinegar, 1/4 teaspoon salt, 1/8 teaspoon freshly ground black pepper. Squeeze the kale with your hand, while rubbing the olive oil into the leaves. If you have dried fruit on hand, add 2 tablespoons (such as raisins, dried cherries, or apricots). Add chopped veggies lingering in your crisper. Cover and refrigerate over night. Top with the remaining chicken and any other add-ins you have from your pantry like nuts, crumbled cheese, thinly sliced fresh fruit like apples or pears, or skip the fruit completely and use up the leftover salsa and toss in some leftover cheddar cheese from your grocery list. Looking for more ways to get healthy meals, fast? Check out my 200 Calorie Fix and ditch those crazy diets forever.